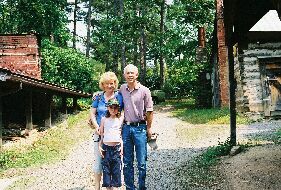 We visited with relatives in Raleigh, North Carolina in May. While there, we stopped at the "Stitch 'n Belch" at the RiRa Irish Pub on Sunday, May 15th, and the gathering of knitters at Borders in Cary on the following Tuesday morning. We never go anywhere without visiting local textile sites. So, we also went to Great Yarn in Raleigh and Shuttle Needles & Hooks in Cary. At the College of Textiles at North Carolina State University, we toured their spinning, weaving, and knitting labs courtesy of Tim Pleasants and William Barefoot. We also paid a visit to Seagrove, North Carolina, where dozens of small potteries turn out wonderful hand-crafted ceramics. 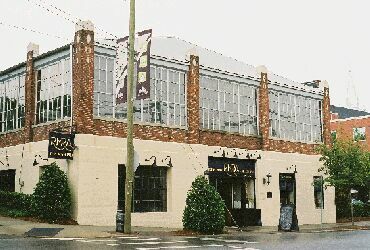 The building housing the pub was originally constructed for Carolina Power and Light as a Car Barn and Automobile Garage in 1925. It is listed on the National Register of Historic Places. 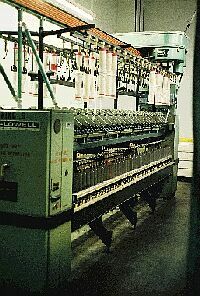 The College of Textiles at North Carolina State University is one of the leading textile schools in the U.S. The photo on the right was taken in the spinning lab. Jugtown is one of the best known of the many potteries in Seagrove, North Carolina. The hand-crafted pottery tradition goes back over 200 years. Kiln to the left. Note typical NC outbuilding on right.